Getty images. 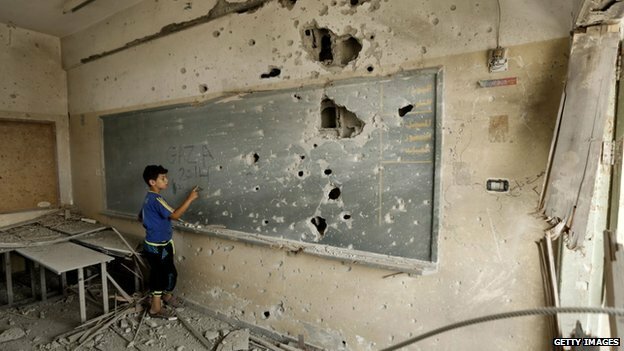 A young boy at the blackboard of a school in Gaza, August 2014. Via BBC. Gaza got bombed 97 years ago when the British seized it, in World War I. In the 21st century, things have not changed enough for the people who live in the area. It’s even worse in Gaza than it was for the West Bank earlier. Clay Bennett of the Chattanooga Times-Free Press took the top prize and $10,000 in the 2011 UNCA and the United Nations Society of Writers and Artists Ranan Lurie Political Cartoon awards. Bennett earned honorable mentions before in this competition. His distinctive, almost simple style, and his sharp and incisive wit, make Bennett a great cartoonist, one of my favorites for a long time. Clay Bennett's Lurie/UN Award winning cartoon, Chattanooga Times-Free Press; inspired by Escher, perhaps, it shows the difficulty in even getting started any talks on Mideast peace. I especially like the ambidextrous feature: The cartoon works upside down, too. Congratulations, Mr. Bennett, and all the winners in the 2011 Lurie/UN Cartoon Awards.